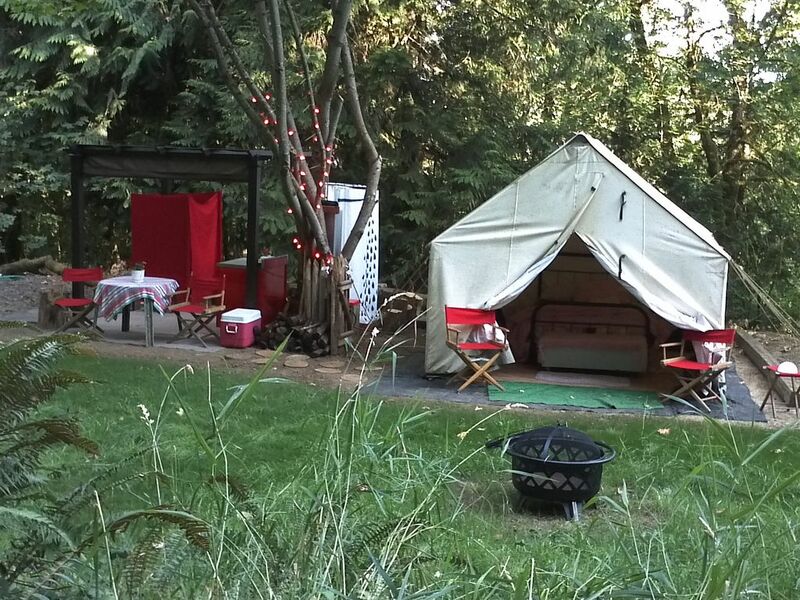 Camp Heaven is a luxurious yet rustic single campsite that is fully set up and ready for your arrival.The large (10x12foot) wall tent has a queen size bed, sheets, pillows and blankets. The camp bathroom is fully stocked with grooming supplies, hairdryer, spa towels, fluffy robes and sandals. The bathroom has a retractable roof in case of rain. The outdoor open air dual head shower is so much fun. There is a fire pit with wood for bon fire or camp cooking. A cooler with ice and bottled water are provided. Coffee service with danish is also provided. Camp Heaven is located on 5 wooded acres 17 miles from Portland, Oregon. The property is completely fenced and gated for complete privacy. This location offers abundant wild life such as birds deer squirls frogs rabbits etc. The trail system offers a great physical activity. There are many activities near by such as wine tasting, bird watching, canoeing, small farms and local produce. I had to cancel my stay due to a family issue. The communication prior to my stay was great. But after I sent the email letting Lila know I wasn’t going to be able to make it I never heard from her again. In fact this survey is the only communication I have had since canceling. There was no refund of course and this was expected but it is disappointing to know that the money was taken and I didn’t even get a thank you. I’m not saying anything bad about the location because I was not there. I’m just disappointed in the lack of communication. I gave 4 stars here because I don’t want to hurt their rating due to this. I'm so sorry you were disappointed in my communication! The reason you used to cancel lead me to believe you had enough on your plate and did NOT need further distraction from my messages. Canceling an hour after check in time prohibited me from any chance of re-renting for the property for that date so offering a refund was completely impractical. I'm even more sorry you had a family issue! Bed was comfy but head of bed dipped down. Otherwise, great! Glamping was fun! Kitchen utensils were adequate. Had a great stay. Camp was clean and romantic as advertised. Very nice getaway! My husband and I loved staying here in this unique set up! We had everything we needed to make our stay comfortable and romantic! From the candles, the lounge area the provided slippers and robes,, to the most inviting and cozy bed! Loved watching movies against the tent walls! Would most certainly stay here again! Actually already talking about renting that tee pee of theirs!!!! Camp Heaven was wonderful. Everything that we needed for a relaxing stay. We will have to stay more than one night next time!